Ever wonder if a book is any good by just looking at the title or cover? Well, as librarians we like to do the hard work for you so that you know whatever book you do choose to check-out will be great. And here are four recommendations we highly suggest! This quick read, that was originally published in 1973 and has been recently updated, gives a crash course on the history of women healers and the rise of the medical establishment. 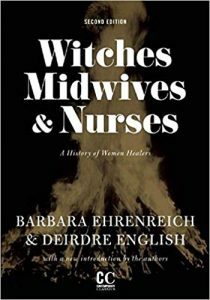 Wrestling the care of medicine and birth out of the hands of women and into the hands of men, this book discusses how the change took place by demonizing traditional healers and midwives as “witches”. The new edition offers an introduction of how things have changed since the first publication in 1973, and how we must continue to work for the change we desire. A perfect read for anyone interested in women’s history, healthcare, and traditional practices. For lovers of food, history, and the tiny details that make up our lives. Considering all of the gadgets, appliances, and variety of foods that we do (or do not) eat, I think we should all learn a little bit more about them. Some of us use a toaster every day and have no idea how it came to be on our counter (See pgs. 109-110), or how the fork left the kitchen and became an acceptable tool to have on Western dinner tables (See pgs. 188-195). Things like sous-vide have changed tremendously as far as availability and cost since the publication of this book in 2012, but this text still stands the test of time. 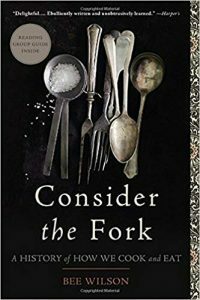 Enjoyable and packed with little pocketbook facts, anyone who loves to cook and eat would enjoy this book. Coming soon by Bee Wilson is her new book The Way We Eat Now, which is released this upcoming May. 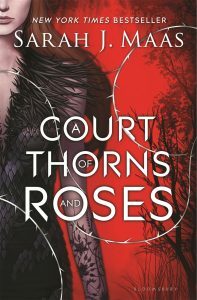 In this ingenious retelling of Beauty and the Beast, nineteen year old Feyre lives in a world divided by a wall. The humans live on one side in constant fear of the faeries who live on the opposite side. But the faeries are not your typical Tinkerbell-like pixies; instead they are treacherous beast creatures, immortal, and with unlimited magic that they can wield over the humans. Legends say the High Fae, the faerie rulers, enslaved the humans hundreds of years ago until the Treaty “freed” the humans. But Feyre doesn’t care about the Treaty so long as the faeries keep to their side of the wall. Keeping her family from starving is more important. Then she accidentally kills a faerie and is forced to live out the remainder of her days with the faeries as retribution. Yet life with the faeries is surprisingly…peaceful…and elegant. And Tamlin, the High Fae who captured her, is no less lethal than some humans she knows, besides his magic and razor claws. But there is a sickness spreading across the faerie land that is impacting the magic and as Feyre’s feelings for Tamlin grow she must find a way to stop it or doom both him and his world forever. 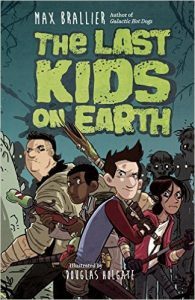 How did the completely normal, average, thirteen year old Jack Sullivan manage to survive the Monster Apocalypse? Well, even he’s not totally sure. And while camping out in a treehouse armed with catapults, a moat, video games, and an endless supply of Oreos and Mountain Dew may seem like a huge pay-off, being chased by the eerily intelligent monster Blarg isn’t. Now it’s Jack, his best friend, the reformed middle school bully, and his crush against the entire apocalypse while also fighting Jack’s own “average” reputation. Can he do it? Other books by Max Brallier: The Last Kids on Earth and the Midnight Blade, The Last Kids on Earth and the Cosmic Beyond, The Last Kids on Earth and the Nightmare King, The Last Kids on Earth and the Zombie Parade, Eerie Elementary series, Galactic Hot Dogs: Cosmoe’s Wiener Getaway, Galactic Hot Dogs: Wiener Strikes Back, Galactic Hot Dog: Revenge of the Space Pirates.